Happy Halloween from your Alaska Zoo family! We hope you are planning to join us for Zoo Boo tonight. Learn more here! 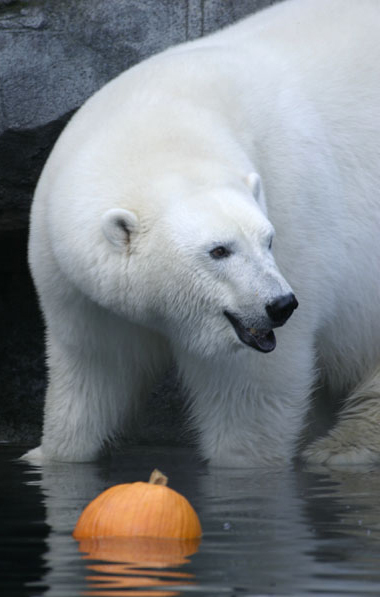 The Alaska Zoo’s animals are on people’s minds as they approach Halloween and wonder what they should do with their pumpkins. We receive many calls and emails from wonderful zoo fans offering to donate their pumpkins to our animals. We love to say yes to whole, uncarved pumpkins - the animals love them and enjoy breaking them open to access the yummy goo inside. But alas, we do not take the carved variety. When pumpkins are carved, the process of decay can set in pretty quickly and we can’t be sure that other items placed inside the pumpkins haven’t made them unsafe. A left over candle, a piece of plastic from a light, chemicals, waxy residue, bacteria - these could all pose issues depending on the animal who ingests it. Only the best for our zoo animals! We try to anticipate their safety and needs, so we must say “nay” to carved and “yay” to whole, decorative gourds or pumpkins! If you are at the store and feeling generous, buy a pumpkin for your local zoo animal today! For more information on accepted food donations throughout the year and the zoo’s donation drop off location, click here. To read an interesting article on the health benefits of fresh, whole or cooked pumpkins for pets, click here. Newer PostParty with Polar Bears at the Polar Bear Birthday Party on January 19th! Older PostWelcome to the Alaska Zoo, Cranbeary!